We specialize in baking delicious, gourmet pizzas; custom ordered, and by-the-slice. We also bake fresh doughnuts daily, with fun flavor combinations. You can also check out our convenience store for: Paninis, Subs, Salads, Coffee, Wine, Beer, Pop, Sandwiches, Cheese, Candy, Desserts, and more! 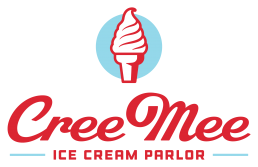 In the summertime, check out our adjacent ice cream parlor, CreeMee, for sweet treats!